Back in 2005, Bruce Logan and his team of Penn State researchers developed a microbial fuel cell capable of converting poop into power. Now, Logan has refined his system to the point where it can produce hydrogen from wastewater or biodegradable organic materials without using a drop of grid electricity, and without emitting even a hint of carbon dioxide. His approach, outlined in the September 19th issue of the Proceedings of the National Academy of Sciences, involves something known as reverse-electrodialysis (RED) -- a process that harvests energy from the ionic discrepancy between fresh and salt water. Logan's bacterial hydrolysis cell (pictured left) features a so-called RED stack that's comprised of alternating positive and negative ion exchange membranes, which it uses to split water molecules into hydrogen and oxygen. Normally, this process would involve about 25 pairs of membranes, but by using RED technology in conjunction with electricity-producing exoelectrogenic bacteria, Penn State's team was able to extract hydrogen with just five membrane pairs. All told, Logan's cells proved to be about 58 to 64 percent energy efficient, while producing between 0.8 to 1.6 cubic meters of hydrogen for every cubic meter of liquid that passed through the system. The researchers' results show that only one percent of that energy was used to pump water through the cells, which are completely carbon ne! utral, a s well. According to Logan, this breakthrough demonstrates that "pure hydrogen gas can efficiently be produced from virtually limitless supplies of seawater and river water and biodegradable organic matter." Somewhere, the US Navy is taking scrupulous notes. Full PR after the break. 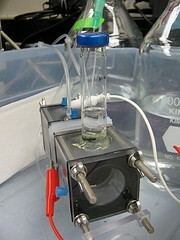 Microbial fuel cell produces hydrogen from wastewater without wasting energy originally appeared on Engadget on Thu, 22 Sep 2011 07:01:00 EDT. Please see our terms for use of feeds.